Posting may be light or Victor-centric this week as I (Leila) am in Uganda for the day job. 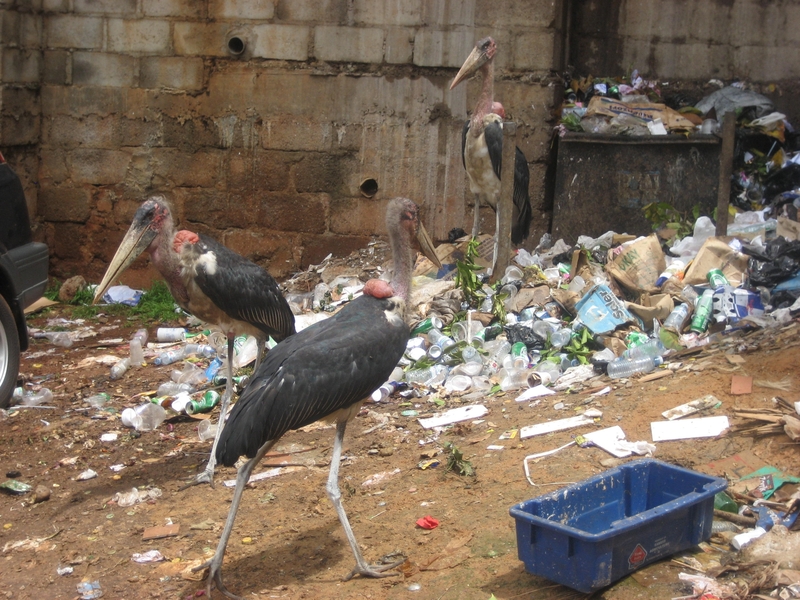 While waiting for my ride outside of the Statistics House in Kampala today, I noticed some Marabou storks lunching in a parkinglot accross the street and promptly dashed over, in heels and through a lot of mud, to take some photos. Let me tell you, I’ve always found the Marabou storks nesting in treetops around the city a bit creepy when overhead. They are even more so up close and on the ground. And so BIG. Imagine if pidgeons were larger than our children! This entry was posted on Monday, April 27, 2009 at 11:18 am and is filed under Trash Politics. You can follow any responses to this entry through the RSS 2.0 feed. You can leave a response, or trackback from your own site. this a nice post. i will back and tell my litle brother for the study books and rocommend your site !